It’s a Friday afternoon and you decide to cut out of work early to get a head start on the weekend. As you hit the highway, you notice that traffic is moving along really well. With any luck, you’ll be at your destination in a few hours. Uh oh, spoke too soon. Traffic has just come to a dead stop. What the heck? Where did all these people come from? The U.S. Department of Transportation Federal Highway Administration studies such things, and has identified six major contributors to highway traffic. Bottlenecks are the leading cause of sudden backups. Bottlenecks happen in spots along the highway where there is a lot of activity. For example, we’ve all seen sections along the road where there’s a sudden reduction in the number of lanes so cars struggle to find a spot. Other times several highways come together and create one giant maze. Even those who are familiar with the crazy traffic patterns can temporarily lose their sense of direction if there’s a lot of traffic. 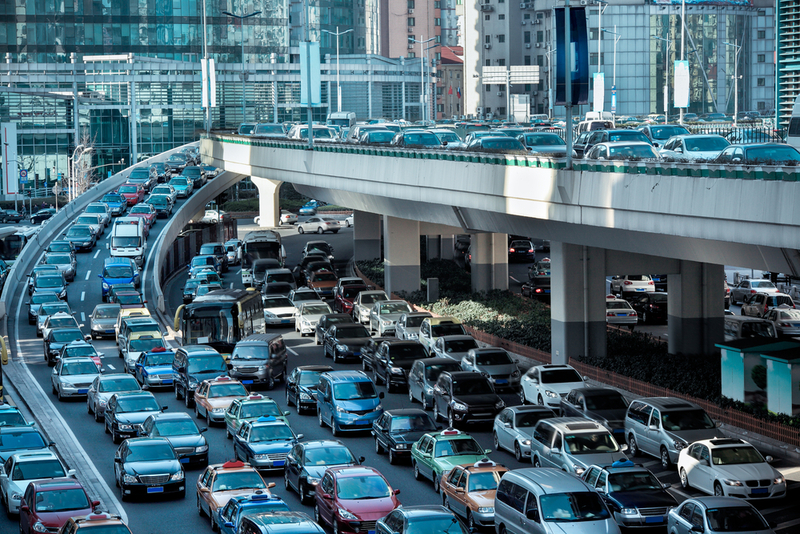 You might be surprised to learn that accidents rank second behind bottlenecks as a cause of traffic jams. Intuitively you’d think it would be the other way around, but crashes, cars that have broken down, and road debris are second. It’s hard to know the best tactics to get around accidents since you probably won’t know where the accident took place or how severe it is until you get closer. As you creep along, keep an eye on what the cars ahead of you are doing. If they’re all changing lanes in the same direction you will too, so look for an opportunity to merge lanes. If other drivers are changing lanes to the left and right equally, look for an opportunity to switch lanes on either side. As you come up on the accident, determine if there’s debris in the road and make sure you have enough room to pass safely. For example, if there’s shattered glass over several lanes, it might be a good idea to move over an extra lane because the last thing you need is to rollover a big chunk of tire popping glass. Sometimes the hold up is a hunk of debris lying in the middle of the highway. Drivers who try to haul too much without tying it down properly can not only cause havoc, but can also cause some serious accidents. We’ve all seen boxes, furniture, and garbage fall off the back of rickety old trucks. If you find yourself behind one of these trucks, switch lanes. If you see debris in your lane and you can’t switch lanes, it’s not a good idea to stop in in the middle of the highway. One person can cause a traffic jam if they constantly tap on their brakes. The cars behind him will apply their brakes, and so the chain reaction begins. Before you know it, there’s a traffic jam. One way to deal with the chronic brake tapper is to keep track of the cars ahead and behind you. Having knowledge of the cars around you will tell you whether or not the brake tapper has a good reason to ride his brakes. If the car ahead of you is braking for no reason, and you know you have plenty of distance between you and those around you, it’s possible to avoid using your brakes by letting off the gas and letting your car coast. Avoiding hitting the brakes will help break the chain of never-ending brake lights. It goes without saying that inclement weather can cause heavy traffic delays. Snow, rain, high winds, hail, and fog can snarl traffic for hours. Unfortunately, if you want to get somewhere and Mother Nature has other plans, you’ll lose. If you’re cruising along and hit a patch of bad weather, and traffic comes to a snarl, there’s nothing you can do. You’re going to wait it out like everyone else. Road construction sometimes brings traffic to a halt. The sight of steel beams dangling from a crane over a highway is enough to scare any driver. But road construction or overpass retrofits are a fact of life. So too are lanes that are re-striped overnight, which cause havoc with the morning commute. And if you’re a frequent driver on a particular highway, it can be hard to resist the temptation to see how much progress the construction crews are making. If you do this, you’re officially a rubbernecker. If you can resist the urge to check out the day-to-day progress of the project, it’ll help traffic keep moving. For those lucky enough to live in cities with a thriving performing arts or sports scene, it’s likely that you’ve found yourself in the middle of a big traffic jam from time to time. If you’re one of the event attendees who is stuck in traffic, consider your time sitting on the highway off ramp as part of the price of admission. Unless you plan to arrive early, you’re not going to avoid traffic. What do you do if you’re stuck in traffic for an event you’re not attending? You might do well moving to the left lanes while letting the others fight with each other to hit the off ramp. Or better yet, find a route that takes you away from the stadium or event venue so you can avoid the traffic altogether. Unless you live in a small town, traffic is unavoidable. Too often drivers get revved up by traffic that isn’t moving. The best thing you can do for your blood pressure is chill out. You’re not the only one not moving. Getting angry or frustrated won’t get you moving any faster, so pop in some tunes, phone a friend, and do your best to stay patient.